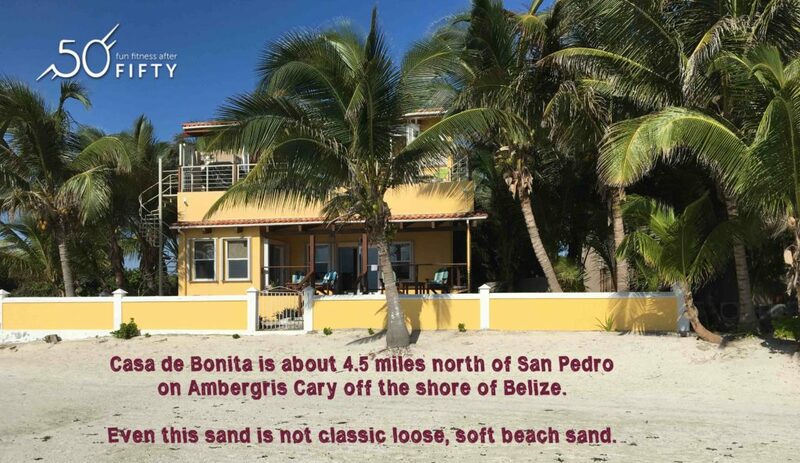 Ambergris Cay is a small, long island off the coast of Belize. 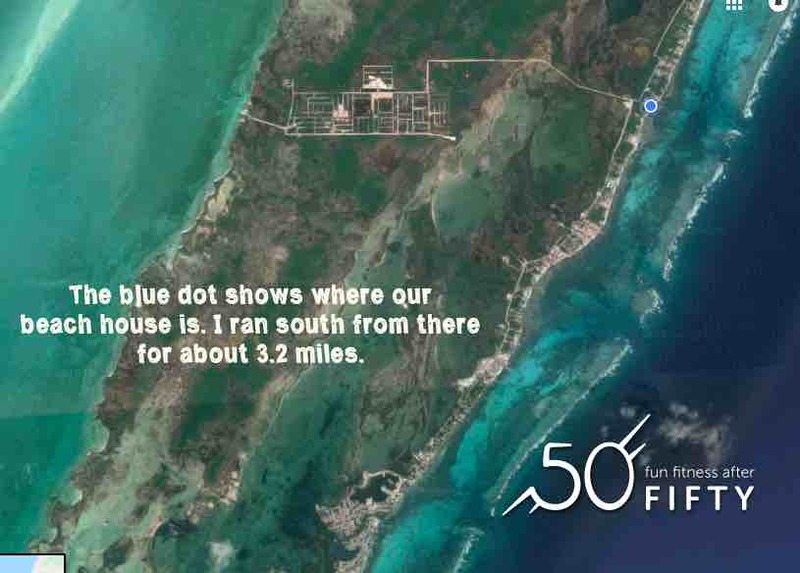 The eastern ocean side of the cay, north of the main town of San Pedro, is where most of the vacation rentals are. These range from beach houses to a couple of posh resorts. Another person we met said the zoo released a 21 foot crocodile into the swamp because it was too big for the zoo. He showed us the best spot to view crocodiles. My husband and his friend went there the next day and saw many crocodiles sunning on the bank. The crocodiles all slipped into the water when the men showed up. The viewing spot is across the road from the new Wyndham Grand Resort being built. We saw one of the odd raccoons when we were driving the main road. It has a much longer snout than what I am used to seeing. There was also a four foot long snake slithering into the swampy area. There are rumors of jaguars, but we haven’t seen any. Also, apparently quite a few deer. There were a couple of large iguanas along the beach path. Here is a list of other animals that supposedly may be seen on Ambergris Cay, which is not that far off shore from Belize and the water looked pretty shallowing when flying over in the small airplane. What I saw the most of on my run was dogs (5). All but one were with owners who kept them under control, though they were loose and allowed to approach me. One of them was not claimed by anyone, but was small and was chased away from me by a fellow tourist. 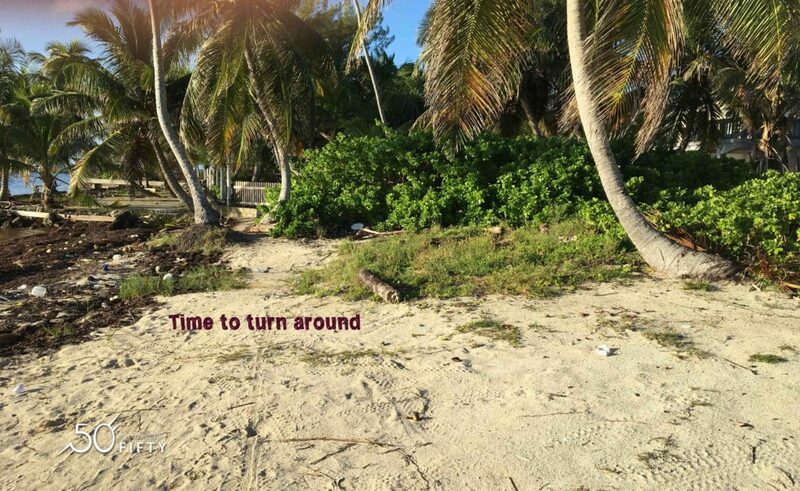 After two two days on Ambergris Cay, I was covered in insect bites. While it is possible I got some on the run, all four of us vacationing together have lots of bites, too. No one else has gone on the path, but two people have been fishing by the swamps for hours. The fourth person has mostly been in a lounge chair, so there is no single activity predisposing people to insect predation. 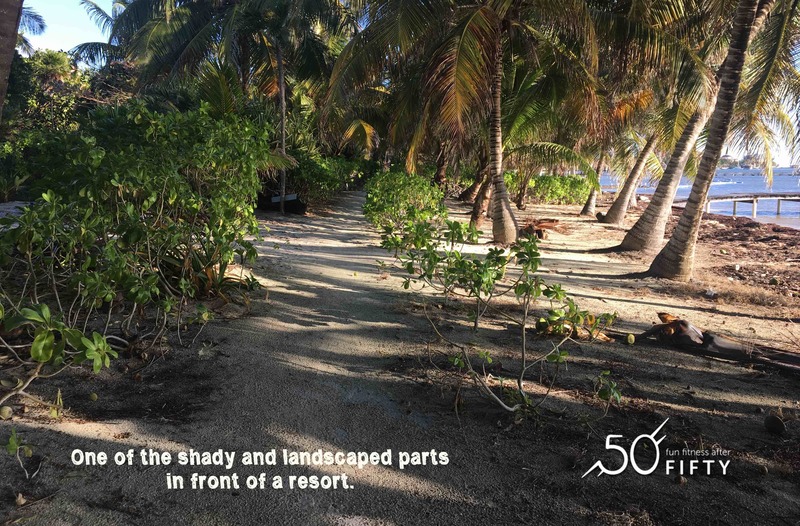 Even though we have seen some mosquitoes (mostly the fishermen have), some research shows that sand fleas are the likely culprits for the myriad of bites. I have not seen or felt being bitten. When I posted about it on Facebook, friends who have been to Belize and other similar climates suggested sand flea. These two articles also say the sand fleas are often a huge problem for visitors. The most commonly recommended deterrent is a layer of baby oil on the skin because the little buggers are so small it blocks them from biting the skin. Apparently they are not repelled by the common insect repellents. As far as soothing the itchiness, I have found that applying some olive oil helps quite a bit. So does swimming in the ocean’s salt water! 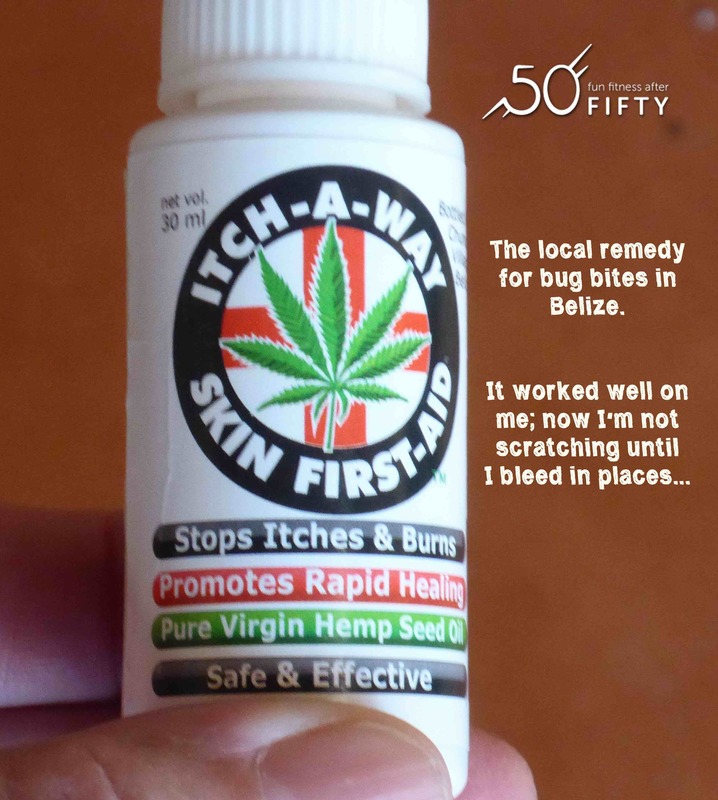 A local resident recommended a hemp seed oil mix that helped a lot. 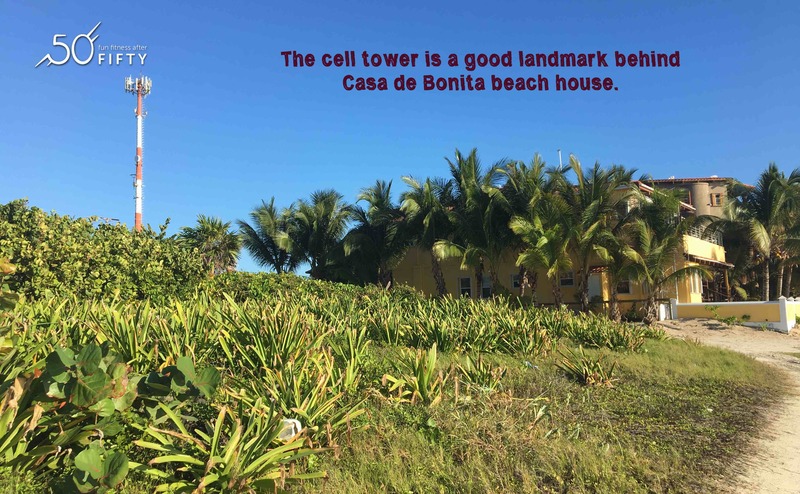 We rented a beach house near the Indigo condominiums called Casa de Bonita (managed by the same staff, so we could use the pool there). We walked north of there one day and there is at least a mile of beach, but in too many places the sea grass washed up covering the shore, there were swarms of associated bugs, and trash was abundant. Going south from Casa de Bonita, there was not exactly an official path, but a number of factors have created one anyway. Right to the south of Casa de Bonita the path is a small road that is also driven on enough by the ubiquitous golf carts on the cay so that tire lanes are distinct. 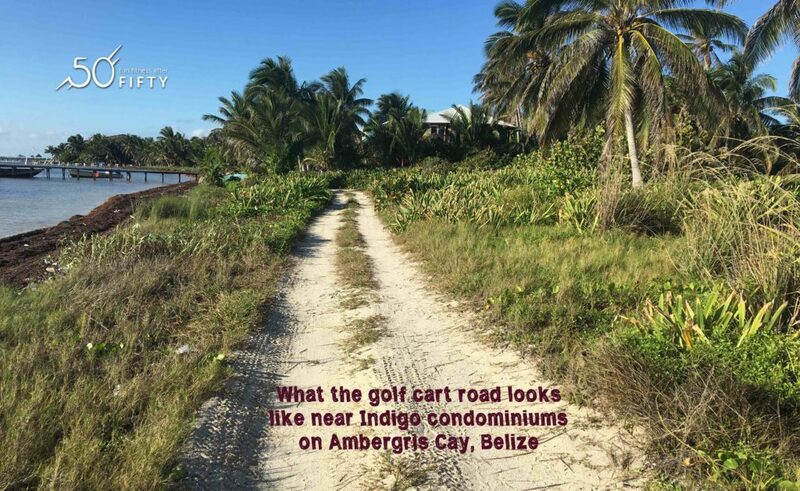 (see first photo above) It is nice that most of the resorts have posts spaced to block golf carts from monopolizing the pathway. For a short section after the small road, the path is more like a deer trail. However, soon it opens up into a swathe of well kept beach fronts. In some places the path is clearly distinguishable, even being lined by well pruned shrubs. In other places there are wide open beach yards, of sorts, but there seems to be a way that most people on the path traverse. 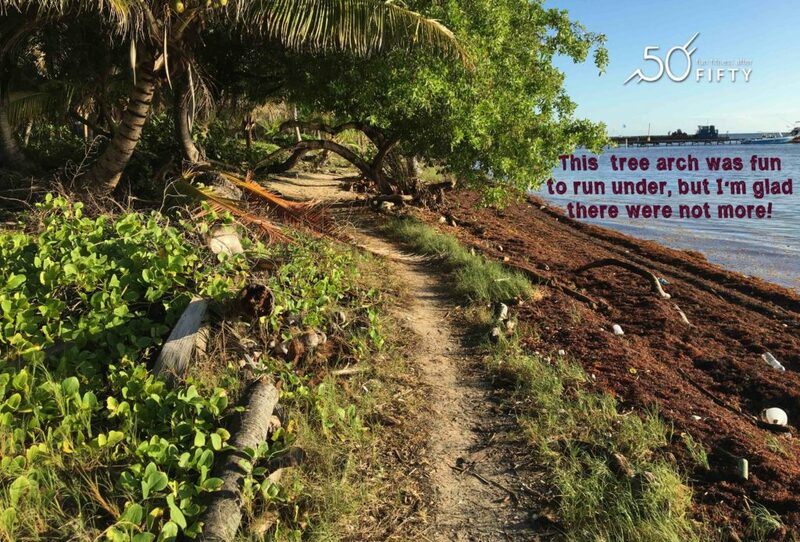 In just a few places the shoreline is neglected and adjacent property either undeveloped or in ruins, but there are still very reasonable places to get through. There are sections where a thin layer of gravel make running less than comfortable, but it was never enough to make me put on the Luna sandals I had in my hip bag. In a few places there are short sections of what seemed to be pitted pavement. I started my run at 7 AM, which was great for the first half hour. By the time I turned around, I was aware I was doing heat training… But significant sections of the path were in the shade during that time frame, so that kept it manageable. Closer to sunrise, there very well may have been less shade. A brief glance a toward the ocean made it clear I wouldn’t be enjoying the ocean view. The sun on the water was blinding. I don’t like to wear sunglasses while I run these days. I don’t think they would have cut that glare enough anyway. I should mention that in the first two days we were here there were rather sudden storms, but both in the afternoon. We could see the clouds coming, then when the rain hit it as like someone pouring a huge bucket out of the sky. It was an onslaught of water that I would not want to be running in for very long. When I run at home, I usually don’t need to carry hydration for runs less than 8 miles. In the dryer Idaho climate, cooling off even on warmer days is easier. Here in Belize, I was wishing I had something to drink by mile 4. I still made it back without feeling totally spent, but I wonder if the second half of my run would have gone better with some lemonade to sip! The humidity meant more perspiration. Again, about mile 4 I was feeling the beginnings of raw spots. If I go on another run this week for more than 3 miles, I will use my vasoline! I finally came to a place where further access down the coastline (or anywhere other than the main road full of crazy driers) was blocked. It was a combination of rock wall and otherwise unfriendly barriers. I checked Strava and found I had run 3.2 miles. I didn’t take photos until on the return, so these are all looking back north. It must have been slightly more than 3.2 miles, because just before I got back to my beach house, I hit the 6.5 mile mark. I did have just a little bit more trouble staying on the main thoroughfare on the way back, though, so that could also account for the extra distance. I was mostly by myself while running. I passed 3 other runners during the time, all going the opposite direction. I crossed paths with a hand full of tourist walkers, plus just another handful of locals walking and biking to work. There were probably about 10 workers, 1-2 at a time, in front of various resorts cleaning up the beach. Everyone was quite friendly, except for the one man who called his dogs away from me with some reluctance and irritation. As I mentioned, there were enough rough patches that I wouldn’t recommend the whole route to newer barefoot runners. However, there was enough loose sand and obstacles that I felt I had an important advantage in balance and ground purchase with my bare feet. I also imagine that shoes would get debris in them and get mucky from the sea grass areas. 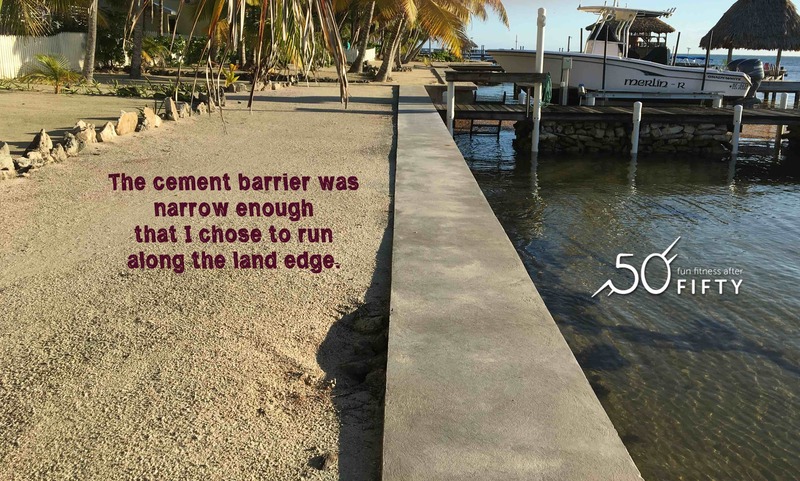 In a couple of places, for fun I ran along the wide cement wall holding the ocean back. Bare feet always make me much more stable for that sort of balancing. If you want to see the map of my run on Strava, here it is. 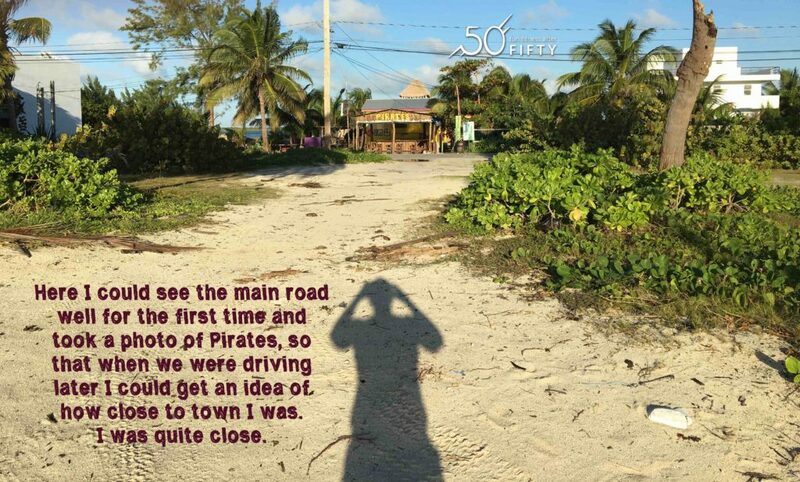 We have driven quite bit around Ambergris Cay north of San Pedro. I really can’t see running on the main road. Too much of the road is right next to the stinky swamps. Too often there are golf carts, bikes, and taxis serving all over to avoid each other, and large grey puddles. I’m sure I would come back covered in clay water, if I came back at all. The beach house management has cruiser bicycles we can borrow, so I hope to ride the path once while here. Meanwhile, I have gotten in both an ocean swim and a pool swim, which I plan to write about later! I am trying to not be too regimented about exercise while here, but I think one more run is likely, too! 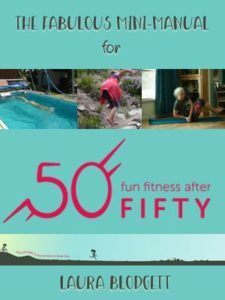 Am I too old to learn something physically challenging? Learning new skills and activities can feel overwhelming for an older adult. I know that beginning horseback riding lessons about 9 months ago was a mix of scary and wonderful. I worried that my body just wouldn’t adapt to something so new. I worried about injury. Make sure you have a foundation of physical strength. Consider cross training that will particularly strengthen muscles that will be needed for action and stability for the new activity you want to try. Don’t schedule other rigorous activities the day before or the day after. For instance, I can still go on a short to medium run either before or after, but not a run that is at the upper limits of my current distance. Rest your mind before a lesson. Learning something new takes a different level of concentration and awareness, both to avoid injury and to learn well. Get enough sleep. This goes with #3. If you are physically tired, your mind tends to be slower. Also, you tend to have less physical strength to use as needed. 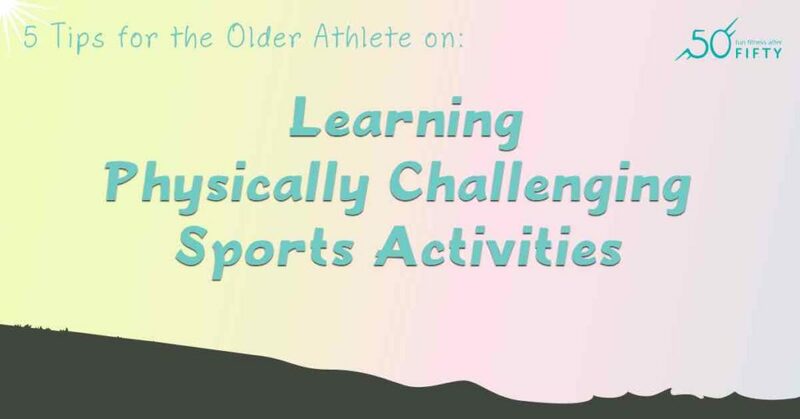 Talk to other older athletes that pursue said activity. It can be helpful to get a mix of those with long experience and those relatively new to trying. 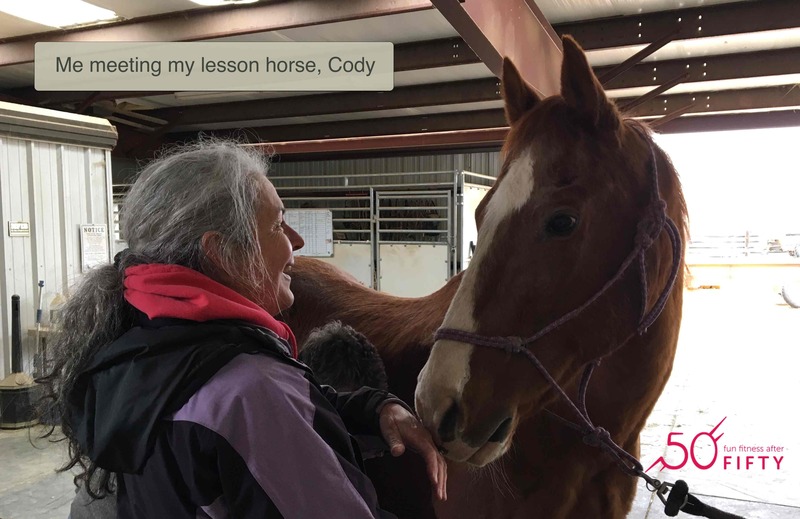 I write more specifics about how to have a good experience learning to ride a horse at my age in Am I Too Old to Learn to Ride a Horse, over at the D&B Supply blog. As older athletes, it can be embarrassing to feel awkward at learning something new, but it is good for us in many ways. Don’t let your fears or the attitudes of others keep you from enjoying continued discovery in life! Do you know the story about Captain Cook making his crew eat sauerkraut on voyages to prevent scurvy? It turns out the commonly told story might not be quite right. First, there was the ever present trouble of how illness was reported. Second, Captain Cook was apparently very good at advocating his opinion. Thirdly, the ship stopped to get other food a lot. And fourthly, the Captain may very well have died as a result of other malnutrition. In the case of ship related malnutrition, even though no one knew the exact cause, people who ate a variety of fresh foods on land rarely had these issues. Such is still the case with malnutrition. A variety of fresh food usually provides very adequate nutrition. Just as importantly in the story is that once foods that helped keep scurvy at bay were discovered, it wasn’t because someone had isolated vitamin C. It was because they ate whole citrus fruits or real juice. Part of the challenge was that it was not well understood how preservation or storage affects the nutritional value of food. And the ship’s doctor who seems to have made the original discovery wasn’t completely clear on what he had found. We live in a time where we have access to a huge variety of foods grown all over the world. This means we are much less likely to have malnutrition due to limitations of our local soil. However, it is still pretty easy to get people panicked about their diet. Plus, supposed quick and easy fixes are more alluring than the harder work of exercise and good eating habits. While it is true that additional isolated nutritional supplements have been shown to help people with certain health issues, it is not so clear that everyone needs to take extra vitamins. There is some evidence that a body adjusts to greater amounts of a nutrient and stops absorbing it as efficiently. molecules produced in laboratories are sometimes not the same as those produced in natural processes. How do you know it is an apple? You may be surprised to hear that the FDA does not monitory dietary supplements. Not that they really keep anyone safe, but that is another story that you can check out here – Death by Regulation, by Mary Ruwart. I’m not a fan of most medication anyway, but the FDA does more to inhibit drugs getting on the market and keeping prices high than anything else. Regarding supplements, here is a private organization that has done a lot of work to help people evaluate supplements. You can listen to an interview of Neil Thanedar, the CEO of Labdoor.com on the Tom Woods Podcast episode 1196, A Market Alternative to the FDA. I’m not saying we need to eat everything raw. Some processing can be useful for digestion or short term storage, which I cover in Simple Nutrition for the Barefoot Runner. Still there comes a point at which you can’t recognize or identify what you are being asked to believe is food. Plus, if you are not eating the nutrient in its natural food form, you may not be getting other nutrients that are necessary for it to work. Sometimes the body needs extra support in the way of specific nutrition or in energy needed to perform. I know when I am running more, I crave more protein. It is weird how I just know what sounds good. It doesn’t have to be expensive protein. And since sometimes different proteins sound better, I have to suppose that there may also be something else in them that makes a difference, too. When I’ve been low on vegetable or fruit intake, my body begins to crave those things. When I give in to eating too much nutritionally deficient food, my body doesn’t feel good. It can take some practice and honesty to figure out what your body is craving versus what your bad habits are craving, but it can be done. If you really feel you need to make sure you are getting more of a certain nutrient, stock up on foods that will provide that. Think about what you are craving and ask yourself why that might be? Sometimes I find myself craving salt due to having perspired a lot. There are good and less good ways to get my salt! Have easy snacks that satisfy cravings in a healthy way. No, your diet doesn’t have to be picture perfect, but a little planning will leave you with good options at crucial times. Then you will find yourself feeling better from overall good nutrition. Be aware that diet fads often suggest avoiding healthy foods that may be just what your body needs at a given moment. Not everyone needs the same proportions of nutrients as everyone else or even themselves across time. It can depend on things such as age, type of physical activities, personal digestive needs, and other stresses in your life. Don’t let the latest hype keep you from eating basic healthy foods as part of an overall varied diet. We constantly have a lot of variables in our lives. It can be difficult to narrow it down to what is helping and what is not. Sometimes we just feel better if we know we are doing something! If you do this, you have to be careful of two things. First, do not obsess about your choices. Maybe tweak things here and there based on observations, but don’t change a lot at once and don’t stress yourself out over them. Just observe yourself for long term patterns. Secondly, be aware of being consistent in how and when you record things. There is a tendency in all of us to selectively notice and record things to fit our own biases or preferences. Sometimes people are looking for a drug or supplement to make them feel better when an attitude adjustment would probably do just as well, if not better. It is pretty well established that attitude affects our body. Our bodies physically responds to mental messages about stress by preparing it physically for stress. This is harmful if it is constant. Its like trying to live our lives at a sprint. Not even the best sprinters can sprint all the time. In fact, they can only sprint a short way once in a while. The human body just isn’t designed to be functioning at peak stress for very much of the time. Oddly, this means that just eating something fun can be a good *supplement*. If it makes you happy, it may be what you need at the moment. Give yourself permission to be happy! This is not an all or none list. 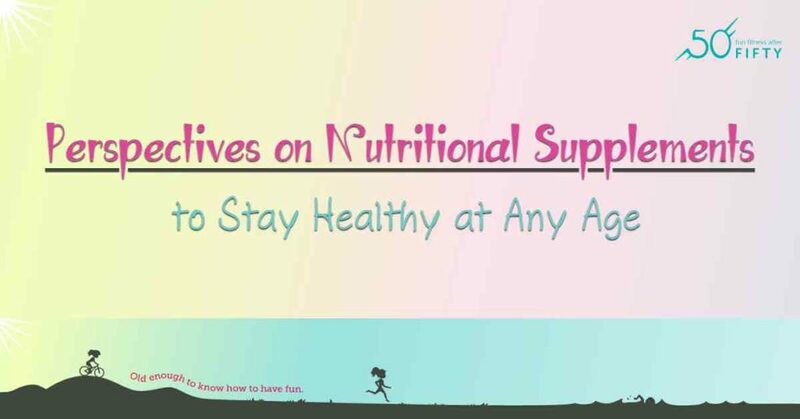 These are just suggestions about how to wisely decide whether or not to take supplements, as well as how to decide which ones you might take. Don’t be pressured by advertising or the latest *scientific* study. But remember, no matter what, food is more enjoyable than any supplement could be. Are You Afraid to Ride a Bicycle at Your Age ? If I crash, will I die? This in spite of cycling being recommended as one of the least stressful exercises for the body. Actually, I wasn’t being foolhardy. I would say it was a combination of trying to trust what skills I do have and working the course. Oh, and encouragement and insight from dear husband. Is this a reasonable approach at my age of 57 years? What is your biggest concern about cycling? The biggest concern is that the older our bodies are, the less resilient they are about healing. Just how much less resilient may be up for discussion, because there are so many more variables than age. Nutrition, overall body strength, and good circulation will all impact healing significantly. There are a number of strategies for bicycle riding, too. If you haven’t been bicycling for a while, you shouldn’t start with a mountain bike challenge. You want to gradually develop the necessary muscle strength and experience that will help you respond to more challenging terrain. Here is my list of advice for getting back to cycling or continuing on your cycling journey. Start with a comparatively stable bicycle. For instance, what is known as a road bike is supposed to be lighter and make cycling more efficient, but it is also quite a bit less stable. Make sure you have a well developed sense of balance and are fairly experienced reacting to the terrain before trying a less stable bike. Avoid traffic. Find greenbelt paths or simple trails to ride on. Drivers are too often unpredictable and unknowledgeable about bicycles on roadways. Bicyclists can be hard to see on the road even when drivers are paying attention. Trying to manage that can make riding much less enjoyable, as well as distract you from learning how to ride your best. Ride at a comfortable speed, but not too slowly. Enough forward motion actually helps you stay upright, especially when you hit uneven spots or debris. Keep your joints relaxed. This includes elbows, knees, back. This will help you react to the terrain with a more fluid motion. It will also mean less stiffness after the ride. If you do have the misfortune to crash or fall, you will be more likely to respond with adjusted movements or roll with the punches, so to speak. Make sure your bicycle seat is angled correctly. Even the best bicycle seat will cause you great soreness if positioned poorly. Of course, if your sitter is not used to sitting on a bicycle, you risk soreness if you increase your time too drastically, but at least start with a well-positioned seat. Find a good seat height to pedal ratio. Typically, you want your leg to still be slightly bent when the pedal is fully extended. If you want to get off to a really good start with this, you might consider having the proportions of your bicycle professionally adjusted. I know avid cyclists who swear by this. All I have ever done is make sure that the bicycle seat is basically at the height of my hip bone. Invest in some cushioned bicycle gloves. This is not a lot of cushion, but it can make your hands much more comfortable. Wear the right kind of sunglasses. You want to both protect your eyes from drying in the motion enhanced wind, as well as avoid being blinded by changes in sunlight. I have a pair of cycling sunglasses that do just that. Make it a habit to alternate pressure points while riding. For instance, when you are not actively pedaling, take a moment to slightly rise off the seat for a second or two. Or make sure that you are not constantly leaning hard on your wrists. Experiment with your brakes before you seriously need them. This includes knowing which are front and which are back brakes. You never want to hit only your front brakes while going downhill! Also, you will want to lean a certain way while braking, depending on hills or turns. Use one of those quaint bicycle bells. Not only is it polite to let walkers know you are passing, but you are less likely to crash if everyone around has an idea you are there. Consider supplementing your outdoor cycling with a stationary bicycle. While there are important differences, this will still help condition your legs and get used to time on a bicycle seat. Let your feet and ankles function with good range of motion. Your knees and hips are designed to be in motion in symphony with proper foot and ankle movement. If you confine your feet you risk stress in the wrong places. Wearing looser footwear (usually sandals) also makes my toes less likely to go numb! Don’t forget basics like a helmet and good inner tubes. And take someone with you who knows how to fix a flat… or have a phone. I have not yet been able to master changing a flat tire. Mechanical repairs are definitely not my forte. So is bicycling all that age dependent? I think we can conclude that most levels of bicycling are not so much a matter of being too old as possibly being unprepared. 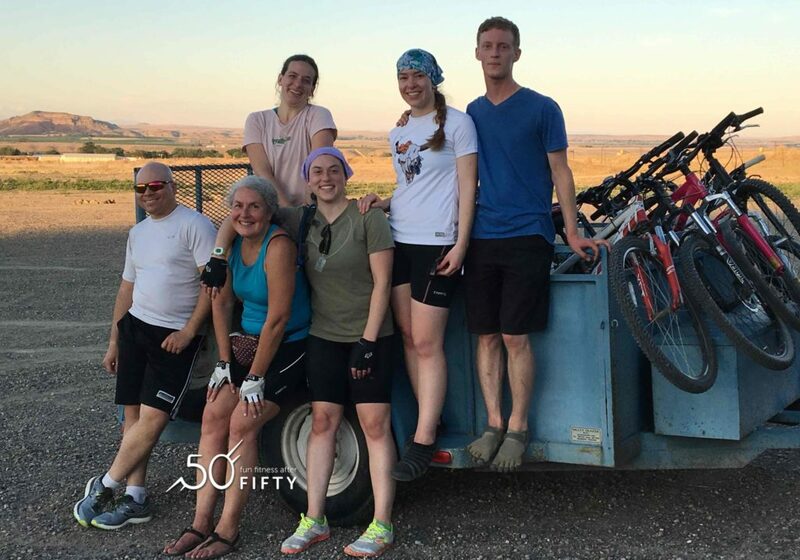 Get a bicycle that is in good repair, find some friends who can both encourage and advise, and get out there and bicycle! When you have built up your skills and strength, don’t be afraid to try some more varied terrain. You can walk hills if you need to. Most of the youngsters walked the same hills I did on that mountain bike ride, and they are all in great shape! My husband powered up more than anyone. He is a few months older than me. 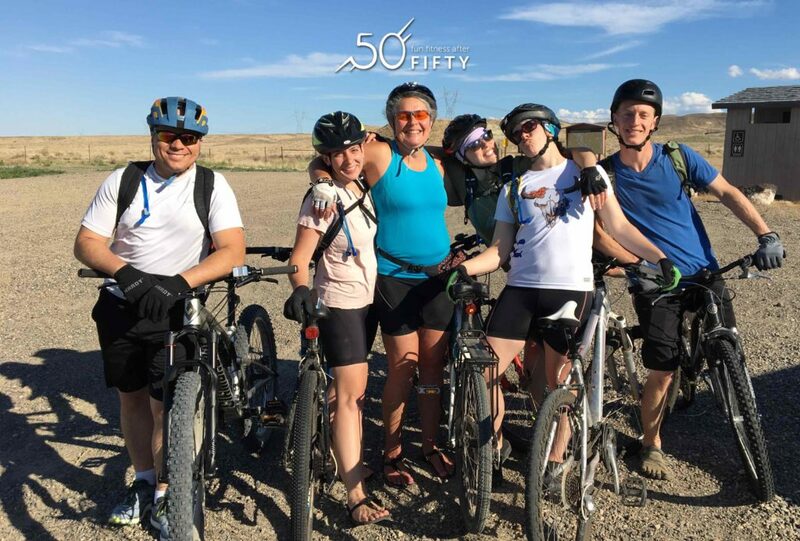 PS – This ride was out in the Owyhee desert, south of Nampa, Idaho, beginning at Hemmingway Butte trailhead. I am the only one over 30 in this photo. Dear husband is the photographer. Post ride, almost 10 miles and only one flat tire later, which wasn’t even mine. Once again, running barefoot has allowed me to stay active while a leg healed. It was not exactly a running injury. I was running with my one-year-old-labrador-bundle-of-energy and needed to correct her with a sudden pull on the leash. Unfortunately, I did this in a twisting way while mid stride. The result was the inside lateral ligament on my right knee getting over-stretched. The knee felt odd right away, in a way that was pretty clearly identifiable. It felt like it might not hold my weight if my steps were not very careful. It came very close to buckling under me a couple of times. I was, a usual, running barefoot at the time, or I expect I would have ended up with worse trouble. I was near the end of my run and tentatively finished, wanting to test what was happening. The knee felt like it would hold up as long as I kept my body mechanics well centered and avoided sudden movements. There was no swelling, so that was a good sign. Over the course of the next couple of days, the stairs were the hardest thing to do. Since significant portions of my living quarters require stairs, I slowly went up and down every day. I cut way back on my running for about 3 days, but was still able to run 2-3 miles and feel very good afterward. In fact, what startled me was that my knee felt stronger right after each run. During the runs, I was careful not to push the speed, but also not to plod. I worked on my form for a relaxed, light gait. Not only did this avoid any feeling of impeding collapse of the joint, but it apparently strengthened the muscles supporting the knee. Around day 4, I decided the knee felt good enough running to slowly increase my mileage again. Again, every time I ran it felt noticeably more stable afterward and continued to feel that stable. Stairs were still quite challenging, so it was like I was living in a world of bizarre extremes. 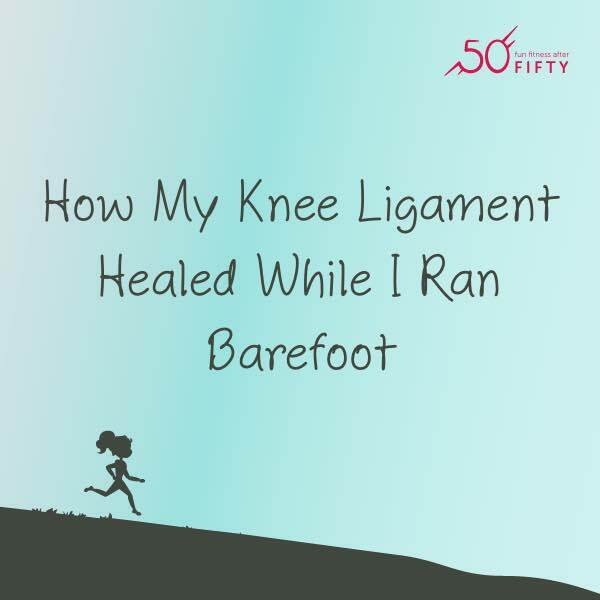 However, knowing that continued movement is often a vital part of the healing process, I continued with the running movements that seemed to be helping. I also experimented with continuing my squats during my minimal weight lifting routine. I did this VERY slowly, making very sure that I was aligned well and nothing felt at all tweaked or strained during the exercises. I did not attempt any new goals, but just stayed right where I had been before the injury. My knee never felt worse after this, so I assumed it was also worthwhile. It was also time to begin planting my garden, and you know things like that can’t wait. Again, I avoided sudden moves and twisting motions, but I still dug, and knelt, and carried. Actually, the time when I was most likely to accidentally tweak my knee was trying to go sideways in to my desk chair. I quickly learned not to do that. A month later, my knee felt 100%! It seemed like the stairs were hard until the end, then all of a sudden they were easy. I was back up to my pre-injury mileage. PLUS, my speed had incidentally increased! I have to attribute this to concentrating on a light, floating stride. If anything, I was holding back on my sense of effort. The speed increase is not going to win me any grand prizes, but it is close to a minute per mile faster for the same effort. Proof again that trying harder is not always the key to improvement. I have had a knee injury before that completely incapacitated my knee for a week and inhibited activity for 6 months. So I’m not suggesting that every knee injury can be dealt with this way. However, I think that we can be too quick to give up on movement when something hurts. Movement is often crucial for proper and timely healing. Those first couple of weeks, I felt really old going up and down the stairs. It would have been easy to rationalize sitting around more. I reminded myself that giving up would definitely make me old, whereas if I kept moving, I had some hope of feeling better again. This week, I climbed (barefoot) rather nimbly over a 4 foot fence chasing my escaped baby goats. If that’s not proof of healing, I don’t know what is!